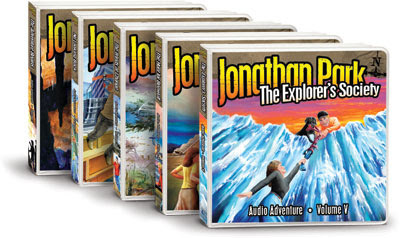 We started listening to Jonathan Park: The Adventure Begins , the first cd set in a radio drama series from Vision Forum that focuses on Creationism. We were a little worried at first that it might be over the kids head, but have been amazed at the questions and discussions that the series has brought up with our kids. As a BONUS, today through Friday (February 27th) anyone can download the entire first album of Jonathan Park by signing up for a Behemoth.com account (it's quick and painless I can assure you). That's over 5 hours of some great entertainment for your kids - for FREE! The download is extremely popular, so the server might be a little slow, but keep trying. If you aren't able to download it right away, it will stay in your cart for you to download later. 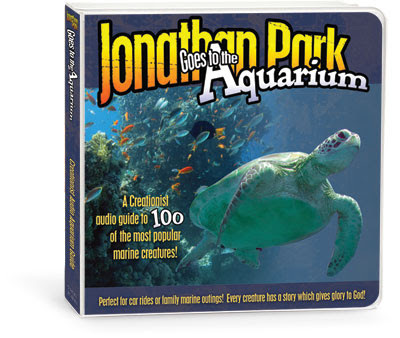 Today only (Friday), Behemoth is also offering a track from Jonathan Park Goes to the Aquarium as a FREE download. This audio series is a guide to 100 of the most popular marine creatures and has 100 2-minute segments that talk about some of the amazing features that the different animals have. Behemoth also offers daily freebies, so be sure to check them out for other great products! We love Jonathan Park ans were excited to see this offer. However, the coupon code is not working for us. It says it has already been used. We were able to ge the one chapter of the Aquarium though. Any suggestions? Thanks for the great F.Y.I! We love JP! I already have the cds but I downloaded it - I know my boys will love having it on the iPod. I also listened to the free aquarium track - I want that album too! It would go great with our Swimming Creatures study. And the Zoo one - well that would go great with Land Animals which is next. Thanks!